The National Association of Tower Erectors (NATE) gave an early industry-wide Christmas present to the nation’s contractors this morning with its announcement that its discussions with federal transportation officials has resulted in an important clarification of existing regulations that will provide critical relief related to companies’ commercial vehicles operations. NATE recently worked with the U.S. Department of Transportation’s Federal Motor Carrier Safety Administration (FMCSA) to address an issue involving the inconsistent and inequitable enforcement at the state level regarding hours of service and log book provisions. The issue stems from feedback received from NATE member companies being improperly cited for violating the hours of service and log book requirements related to their commercial vehicles. Under federal rules, commercial vehicles classified as utility service vehicles are exempt from hours of service and log book requirements. Accordingly, in the Association’s discussions with FMCSA officials and congressional staff, NATE strongly asserted that its members’ commercial vehicles involved in utility work – such as repairing, maintaining or operating any structures or physical facilities that deliver wireless services – should similarly be exempt. The Association requested, and subsequently received, a national interpretation letter from the U.S. 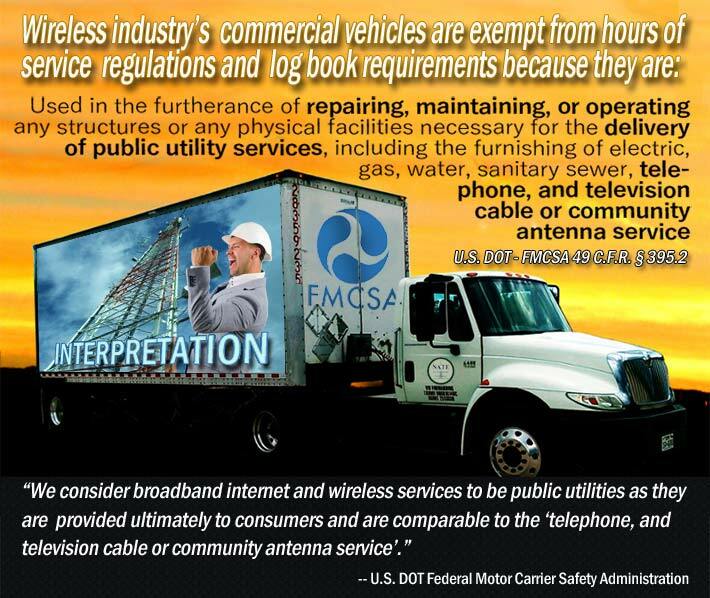 DOT – FMCSA confirming their understanding of the definition of utility service vehicle as outlined in 49 C.F.R. § 395.2 to include those commercial motor vehicles engaged in repairing, maintaining and operating structures or other physical facilities for wireless communications and broadband internet. (2) While engaged in any activity necessarily related to the ultimate delivery of such public utility service to consumers, including travel or movement to, from, upon, or between activity sites (including occasional travel or movement outside the service area necessitated by utility emergency as determined by the utility provider) ;…..” [Emphasis added]. provided ultimately to consumers and are comparable to the “telephone, and television cable or community antenna service” stated in the regulation above. They are transmitted to consumers over the same types of cables as television and telephone services. At the time the §395.2 definition was written, broadband internet services were not in common use. NATE has mailed an official copy of the letter to all of its contractor and construction members and encouraged these companies to place copies of the interpretation letter in the glove compartments of all of their commercial motor vehicles. NATE members have been instructed to utilize the letter as documentation that their firm’s scope of work is classified as a utility service by U.S. DOT – FMCSA. 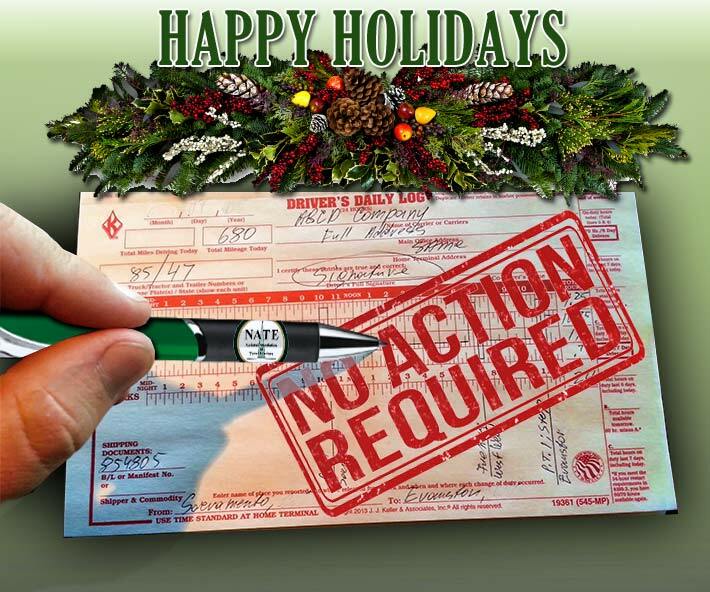 As such, these companies would therefore be exempt from hours of service regulations and log book requirements and not subject to citations when their commercial vehicles are involved in utility service work. 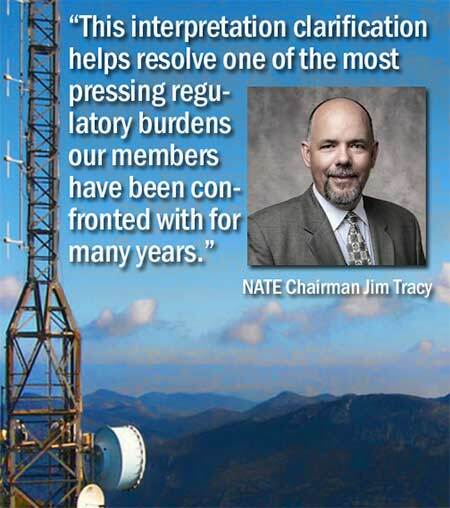 “This interpretation clarification helps resolve one of the most pressing regulatory burdens our members have been confronted with for many years,” said NATE Chairman Jim Tracy who serves as CEO of Legacy Telecommunications, Inc. in Burley, Washington. “NATE listened and proactively responded to the complaints and needs of our membership by vigorously addressing this issue at the federal level and obtaining important regulatory relief for our members,” added Tracy. “Securing this U.S. DOT – FMCSA national letter of interpretation is yet another example of NATE’s influence shaping legislative and regulatory policy in Washington, D.C. and our unwavering commitment to serve our membership,” stated Executive Director Todd Schlekeway. NATE members and industry stakeholders are encouraged to contact the NATE via phone at (888) 882-5865 or e-mail at nateoffice@natehome.com with any questions regarding the interpretation.